Milwaukie lineman Kaiden Durheim has some friendly advice for the other high school football teams that will line up against Milwaukie this season: Do not sleep on the Mustangs. Those who do could be in for a rude awakening. "We've got a good squad," said Durheim, who earned all-Northwest Oregon Conference first-team honors on offense and honorable mention on defense as a junior last season. "Our line is as good as ever and I feel like we have the players to do something good this season." How realistic is that heading into Friday's 7 p.m. season opener at McMinnville? It's hard to know what the expect, considering the Mustangs have a new head coach (Colin Schaeffer), they're running a new offense (wing-T), and they're breaking in new starters at several key positions, including quarterback, halfback, fullback, tight end, linebacker, and defensive back. On top of that, the Mustangs' have had to relocate their home field to Alder Creek Middle School during the multi-million dollar renovation to the high school, which means they're having to bus to and from practice. All that smoke-filled air the engulfed the state last week forced teams to take their workouts indoors, making Milwaukie's already-complicated situation that much more complicated with the season opener just around the corner. And if that's not enough, the Mustangs also lost Korbyn Amundson indefinitely after the junior running back/defensive back suffered a broken leg in the team's Aug. 18 inter-squad scrimmage. "The situation isn't the best," Durheim said. "The smoke, not having a field, having to waste time taking a bus to practice … it's more a mental obstacle than anything. Some people are irritated, but we're trying to make the best out of it." Schaeffer, a 1999 graduate of Milwaukie who spent last season as the defensive coordinator on Kevin Hastin's staff at Newberg, has been impressed with the Mustangs' enthusiasm and stick-to-itiveness in the face of less-than-ideal conditions. "I don't think there's any other program that has had to deal with what we're dealing with this year," Schaeffer said. "All things considered, I think the kids are showing up and doing whatever they can. I'm really proud of them, because I think it would be really easy for a kid to get discouraged under these circumstances, and I just haven't seen that. "It's coming together. I think we've got a good core group of seniors. It's been a challenge getting everybody on the same page, but I think we're getting there. We just need practice time, like everybody right now." Moving indoors last week also was more of a hindrance than a help when it comes to installing a new offense. "I think the kids are still learning the same things and we're still teaching the same things. We just can't see it in action," Schaeffer said. "We're getting great conditioning in, but we haven't had much thud or contact practice, 11 on 11. We don't have room for that in our gym, so that's the part as a coach that you want to be able to see at full speed. "You want to see it and make sure it looks good. And I've always believed the kids have more confidence when they see it, so that's the thing that we're missing." Milwaukie's offensive line revolves around three seniors in the middle – Jacob Delamater at center, Austin Aune at left guard, and Durheim at right guard – with junior Conner Rice and senior Obermars Martinez at the tackle spots. "Kaiden and Austin are athletic, hard-working kids that in our new wing-T system are perfect fits for the guard position," Schaeffer said. "Both our guards I'd say are the strongest part of our offense." Martinez is a 5-foot-11, 350-pound senior who came out for football for the first time after spending last fall as a reserve forward on Milwaukie's boys' soccer team. He's also on the Mustangs' wrestling team. "He is extremely athletic for a 350-pound kid," Schaeffer said. "At the Metro-area Lineman Challenge, he bench pressed 185 pounds 29 times and he ran the 40-yard dash in 5.8 seconds. He's a wrestler, so he's got the physicality part down, and he has been picking up on what we want him to do really fast." In the backfield, the Mustangs have junior Nick Cooper at quarterback, seniors Logan LaPine and Cameron McPherson at halfback, junior Juan Hernandez and senior Evan Layton at tailback, and senior Manuel Mendoza at wide receiver. Many of the same names will see double duty on defense, including Aune and Durheim, who will both help direct traffic from linebacker positions. Milwaukie opened training camp with 51 players -- a 34.2 percent increase over the 38 they started the season with a year ago and enough to allow the Mustangs to field three teams for the first time in several seasons. "We're getting a lot of kids out and the energy is really good," Schaeffer said. 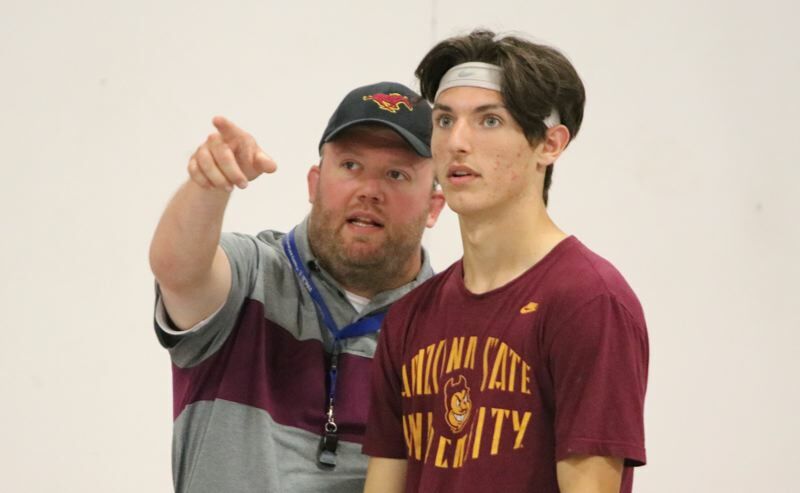 "We took 39 to the team camp at Cascade High School and we've been growing our numbers since then and we're hoping that there may still be a few more freshmen trickling in. "I'm really excited. I think a lot of people from the outside could look at our situation and see all the challenges and things that we have to overcome and assume the worst, but I think from the inside we're really confident with what we're doing and we're ready to go."